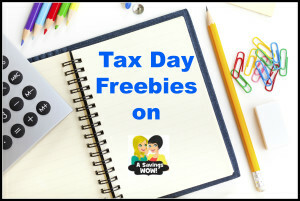 Get Your Tax Day Freebies Today 04/15/13 | A Savings WOW! Today’s tax day and whether or not you are done with yours, many retailers and restaurants are offering some freebies for you to help make today a good day. Thanks to Time 2 Save Workshops for compiling this list and sharing it with us! Are there any other tax day freebies you’ve spotted that aren’t included in our list? Please let us know by leaving a comment below.